My exposure to Babylon 5 came many years after its original mid-’90s broadcast, when it aired nightly on SyFy (then Sci Fi) in the early 2000s. Initially, it was my father who became obsessed with the show and insisted my mother and I would love it just as much. He was right. We taped every episode and eagerly discussed the plot at dinner. As soon as the DVDs were released, we bought them. We stocked up on the books, watched the made-for-television movies, found the comic, and fell in love with the show’s short-lived spin-off, Crusade (which my father sometimes, and rather erroneously, calls Excalibur). As a teenager, I listened to the DVD commentaries because I was fascinated with the process of story. 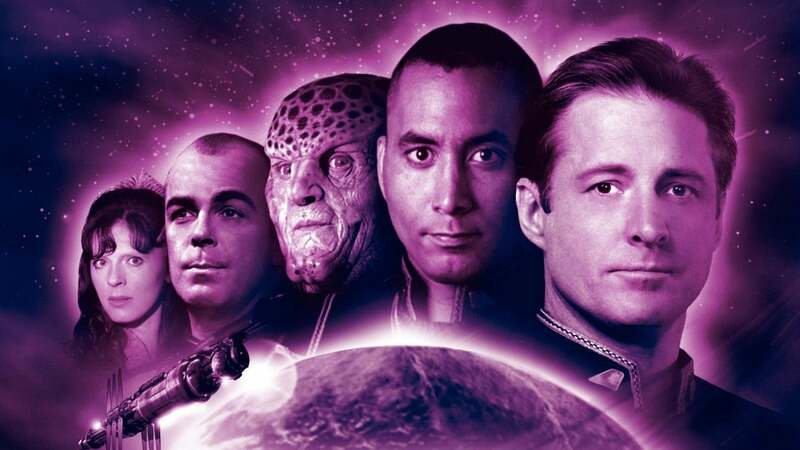 My parents still hold to our tradition of watching it annually, and while I haven’t kept the tradition since being married, my rewatch last year reminded me how Babylon 5 can speak to each new generation. From the get-go, the show was designed to be “a novel for television,” meaning it would have a definitive story arc over multiple seasons. Nothing remains stagnant on Babylon 5; every character has their own arc, and political alliances between races shift. Every species is populated with good people and bad people. There are those in positions of power out for selfish gains and those who wish to make the galaxy a better place. In the first season, Ambassador G’Kar of the Narn Regime says that “no one here is exactly what they appear,” and truly, it’s a fitting description of the characters and plot of this series. The story comes from one particular person, creator J. Michael Staczynski. If you look at writing credits for the show, you’ll see he was responsible for writing about 25 percent of season 1, about 50 percent of season 2, all of seasons 3 and 4, and most of season 5. Staczynski’s feat is extraordinary, especially considering most TV episodes are written in writers’ rooms. The arcs were already planned, the ending known ahead of time. This luxury isn’t even afforded to most television shows today, and it’s probably why so many end poorly. Babylon 5 begins in the year 2258 and ends in the year 2262, with each season covering one year, and the setting is neither utopian nor dystopian. This is an important distinction, considering most science fiction tends to favor one or other. Instead, humanity has been carrying on quite the same as it always has, and much of our own society can be found in Babylon 5’s universe. It has news stations, elections, meddlesome politicians, radical terrorist groups, workers unions, comedy duos, sports, newspapers, religion, poverty, oppression, tyranny, cultural foods, museums, mega corporations, the post office, racist groups, and clubs. There’s even an episode in which the characters have a conversation in the bathroom. The story of B5 feels so familiar because it’s relatable, and that relatability will stick around no matter how old the show gets. In this universe, humanity has expanded to the stars and finds itself in the middle of the strength and technology tiers. There are alien races in the galaxy who are older and stronger, and those who are much older and stronger still. Ten years prior to the story’s beginning, humanity was nearly the victim of genocide by a race that was more technologically advanced; this race, called the Minbari, decided to surrender rather than obliterate the Earth, and humanity’s brush with extinction precipitated the need to build a diplomatic station. Season 1 is about the commander of the titular Babylon 5 space station, Jeffery Sinclair (Michael O’ Hare), learning why the surrender took place as well as understanding his own past. The first season also hints at a dark and dangerous threat lurking in the outer rim of the galaxy. This threat, which becomes clearer as the show progresses, is what the main plot centers around. Because of personal reasons, O’Hare was unable to continue playing Sinclair, so the character was replaced by Captain John J. Sheridan, brought to life by Bruce Boxleitner (Tron). This change could’ve been disastrous, but to the show’s credit, it works. In a later season, Sinclair gets a conclusion so befitting his character that it made me believe he had always been meant to leave Babylon 5. Straczynski also took advantage of the character change and started Sheridan in a different place than Sinclair. The first commander had been pensive and serious. Sheridan comes to the station upbeat, smiling, and optimistic, but over time he becomes more thoughtful and wise, closer to where Sinclair starts. This makes for better character progression, in my opinion. Minor characters in Babylon 5 also are given character arcs and purpose, which help give the story a sense of depth and evolution. A character going by the name of Neroon only appears in a handful of episodes, yet evolves and changes drastically throughout the seasons, significantly impacting the story. My personal favorite minor character, written specifically for and played by Star Trek’s Walter Koenig, is one of Babylon 5’s greatest antagonists, the telepath and Psi Cop Alfred Bester. Straczynski could’ve easily made him a one-dimensional, finger-tenting villain, but he didn’t. Bester is funny. Bester is sarcastic. And most importantly, Bester is human. There are people he cares about, and there are clear motivations to his actions. The dozen times he appears on Babylon 5 are a delight, even if the protagonists find him to be the unequivocal worst. Babylon 5 being a science-fiction television show with a smaller budget, there are aspects that haven’t aged well. The pilot is so very ’90s, and it definitely feels dated. Season 1 is a slow start, with a good chunk of the plot being episodic in nature rather than part of the main story arc. Straczynski himself has expressed some dissatisfaction with the first season, calling it “dodgy” and “rough.” He said on Twitter earlier this year, “I would’ve shifted directors earlier than we did, foreshadowed some arc elements a bit more (I was still figuring out how to do this), strengthened the supporting characters, gone for some more complexity in the structure of the stories.” My personal opinion is not that season 1 is “bad” but rather that it’s harder to see just from that season what makes Babylon 5 so special. I wholeheartedly agree with Barrett. Despite the stigma and obstacles Babylon 5 faced, there is plenty of room to love both it and Star Trek. I sure do. Trek was part of my childhood and continues to be part of my fandom. Rarely if ever do I compare the two franchises in my mind. So, if you’re a lover of science fiction but have never given Babylon 5 a try, I highly encourage you to so. With a gripping story, wonderful characters, and plenty of mystery, it’s a saga that sought to push boundaries and break stereotypes. You can find the entire show available for streaming on Amazon Prime.